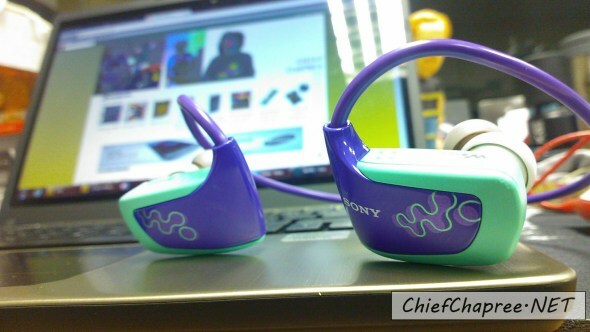 Never leave home without it: my current MP3 player, the wearable Sony Walkman NWZ-W262. I just love music and obviously, I listen to them while running. It is almost impossible to see me running without my trusty MP3 player and since I'll be participating in the Standard Chartered KL Marathon 2012 10K tomorrow, it is time to choose some songs for the event. I don't really have a specific theme in choosing all these songs. They are pretty much on my list because I just want to listen to them during the run tomorrow, heh. All smiles at the finishing line - my first event, the Energizer Night Race 2010 in Cyberjaya. Yup, it is indeed an hassle. You have to wake up as early as 3 to 5am, drag your sleep deprived body to the venue, looking for a safe spot to park your car so early in the morning or have to pay midnight charges for cab (like me, usually), going through so many people at the venue, bracing the jam + road closure on the way back and the list goes on...but why more and more (through my personal observation, of course) young adults under 30 years old are participating in running events? For many, running is not only just for getting fitter or to trim down those extra kilos. Some actually viewed it at a bigger scale - as a rite of passage. Hence, it could be one of biggest moment of their life for your friend/significant other. That is exactly why you need to be there and celebrate them. I was fortunate enough that someone was there at my first running event in 2010. We might not talk with each other anymore due to unfortunate circumstances but nevertheless, that was one of my fondest memory of her. That might sound a little bit grim but that is a personal example of what I'm trying to say in this post. No offense to the Arab folks here but seriously, quite a lot of you guys are a menace on the road. Being a Multimedia University students back then whereby there are significant number of Middle Eastern students in addition to others from surrouding colleges, driving/riding on Cyberjaya roads can sometimes become pretty dangerous. Seriously. In before YOLO...right, YOLO that brain of yours and you might just end up like this. Keep hooning to video games or turn professional, guys. This is my friend, Alda Tan. He is a musician. Not only he is a very good musician but a very very very talented one as well. In fact, he has dedicated almost his entire life to music with bass as his principal instrument. I can't really remember how and when I met him but it was most probably sometime in 2002 or 2003 through a local music forum called Jamtank. Being a (on-and-off) bassist, it was natural that I ended up trolling around at the forum's bassist thread in which I believe was created by him. From there, we walked along together occasionally through the very colorful world of local independent music and our own music as well as life adventures. We bought (one of) our basses - mine is Cort Curbow 5, his is Warwick Streamer Standard - at the legendary Sujesh's House of Bass at around the same time. It was quite funny because we like both basses so much and we can pretty much ended with either one. He was my only proper bass teacher although it was only for a month. It was so short that he only able to taught me two things: the structure of major scale and Circle of Fifth. These two subjects stuck with me ever since even though my bass knowledge is disappearing from my mind as the day goes by due to lack of practice. I also bought majority of my bass effects - Boss ODB-3 Bass Overdrive, Ibanez BC5 Bass Chorus and Ibanez SB7 Bass Synth - from him and trust me, he sold the whole set to me at a bargain price. He borrowed some of them from time to time for his show which I found rather hilarious. At times, he was my boss too. 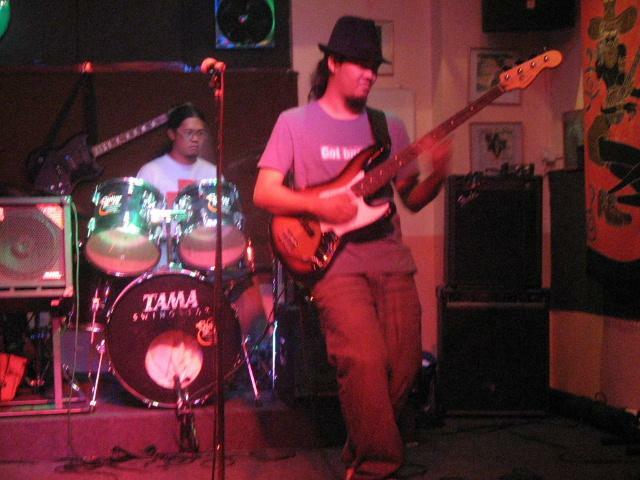 I was his bass tech for couple of gigs including this particular Rock The World (I forgot which year but it was in Stadium Merdeka) show in which he sessioned for quite a number of bands (he is really known for this). Not to forget, I also worked as part-time roadie at NTV 7's Rock Unite reality show few years ago (can't even remember when the show took place) through Stellar Entertainment, the company he co-founded with Rahul of One Buck Short. Naturally, he helped my bands in one way or another. I remember he became the sound guy at one of my band's (that time was Service Provider for The Poor) show in the old Paul's Place - it was still at Uptown Damansara that time - and more recent, he offered my latest band (The Wishing) its first full band gig ever over at The Artista in July 2011. There might still be more but in short, many awesome moments in my musical journey was made possible by or through Alda. Since Alda is pretty much one of the most well known figure in the local independent music scene thanks to his experience, knowledge, friendliness and hardworking attitude, I'm definitely not the only one who feel that way. Unfortunately, I no longer get to see him much when my life started to become swarmed with writing duties since few years ago which in hand made me become more detached from my musical activities. These days we usually saw each other only at gigs or concert and the most recent one was on 18 March this year at Starbucks in The Gardens, Mid Valley. Fresh from his gig with Joe Flizzow at Future Music Asia Festival (that's how I know the date), I asked him of his duty as the music director at Flizzow's Kartel Records. The job is quite different from what his usual stuff, he said but definitely a good one. He certainly sounded very happy with his current duty there. Little that I know, that was the last time I ever get to spoke with him personally as Alda fell into a coma due to a stroke just 10 days later. He passed away earlier this week. When I told his dad, "Alda is a good friend. I don't have any bad words for him," at the funeral service yesterday, I really mean it. Alda is simply one of the finest man that I ever met. 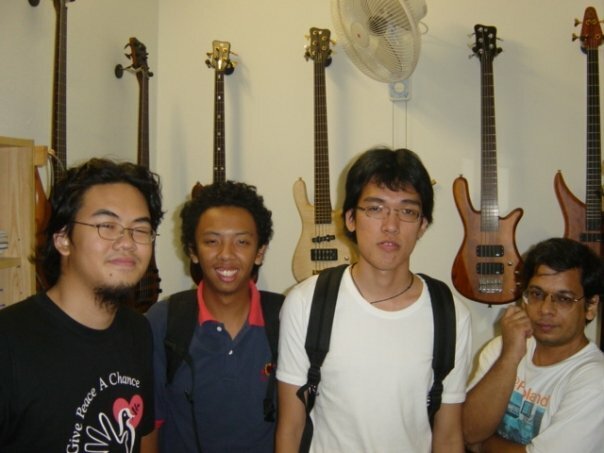 At the legendary House of Bass: [L-R] Alda, me, Eugene Koh (still plays bass for Paolo Delfino I believe) and Sujesh Pavithran (of SquareCircles and the HoB's owner). Special thanks to Team Alda for taking care of him and being there for him right at the moment when he need it the most.